Booster developed especially for hunting and working dogs! Meet the complete Booster -series especially developed to meet the nutritional requirements of hunting and working dogs! 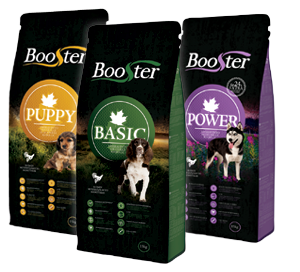 The Booster Range includes complete foods for puppies, normalactive adult dogs and very active adult dogs. The products are made using great amounts of hiqh quality chicken meat – the source of carbohydrates is corn. Booster is totally wheat- and soy-free and doesn't contain any beef or pork. The modern functional qualities help to maintain health and the performance of an active hunting dog. The products are preserved with a natural antioxidant, vitamin E.
Read more about the different Booster -products by clicking on the buttons on the left side. Each food has properties, which are introduced on the right side of the foods name. You can read more about these properties by hovering over each symbol. On the rightmost side you can see the amount of protein and fat contained in the food.